Paedocypris is a species of fish found in Indonesia in peat swamps and blackwater streams. 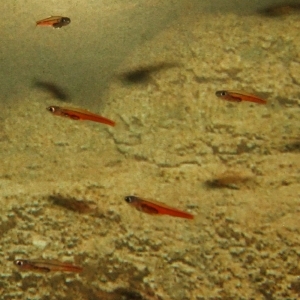 It is the smallest known fish in the world with females reaching a maximum size of 10.3mm and males 9.8mm. 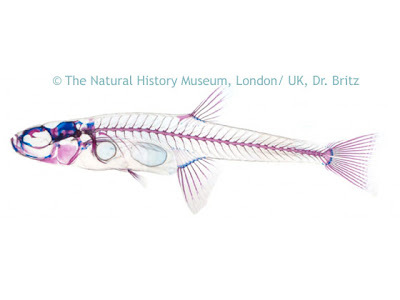 The Paedocypris' miniature transparent body lacks the normal features characteristic of adult fish. For example, a bony skull structure around the brain. They have a unique sexual dimorphism: The males have highly modified pelvic fins, with the first ray terminating with a hook-like projection of keratinized skin. Males also have a pad of keratinized skin in front of the pelvic fins. It is hypothesized that these modified fins are used to grasp the female during mating, or to keep position over a spawning surface. Female Paedocypris captured with the Jenoptik C5 microscope camera.